What is modern art? Why do we either love it or loathe it? And why is it worth so much damn money? 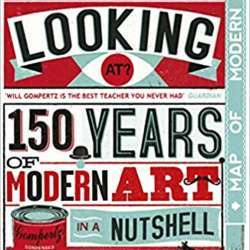 This book is a dazzling tour that will change the way you look at modern art forever. This is the part 2 of the discussion of the book "What Are You Looking At? Protected content of Modern Art". We will read the second half of the book (last 10 chapters - Protected content . We will then explore the museum looking for the pieces of art mentioned in the book that are at the Tate. Mainly: Borgeous, Ernst, Fontana, Dalí, Judd, Lichtenstein, Lond, Moholy, Morris, Paollozi, Pistoletto, Stella, Warhol. It will be a great day to see some of the most talked about pieces of art in the world and discuss different opinions about them.